Atlantis was a mythical island nation mentioned in Plato’s dialogues “Timaeus” and “Critias. This has been an object of fascination among western philosophers and historians for nearly 2,400 years. Plato (c.424–328 B.C.) described it as a powerful and advanced kingdom Beyond The Pillars of Hercules (Gibraltar) that sank, in a night and a day, into the ocean around 9,600 B.C. The ancient Greeks were divided as to whether Plato’s story was to be taken as history or mere metaphor. However, since the 19th century, there has been renewed interest in linking Plato’s Atlantis story to historical locations, most commonly in and near the Mediterranean Sea or somewhere out in the Mid Atlantic Ocean. I explain my theory about Atlantis in detail. Several years ago, when I could afford to travel and visit warm climate areas when it was too cold to do landscape work in Nevada, I visited several countries in Central America. These included Mexico, Belize, Guatemala and Honduras. This was mostly to visit Mayan ruins and to write about them. Being an avid reader, I happened to read a few chapters in the Book of Mormon one day from a historical perspective. 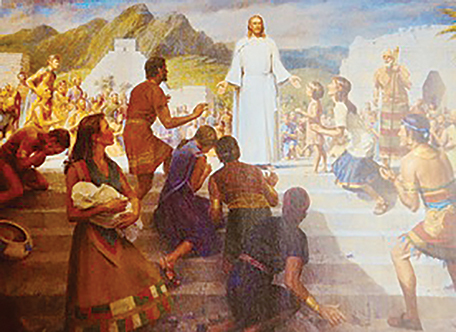 I found that the Mormons believe that Jesus Christ did in fact survive the Crucifixion and was able to make his way, most likely on a Phoenician ship, to Central America where he resumed teaching his Gospel to the Mayan natives. Not being a fan of either the Jews or the Romans following the Crucifixion, he decided to get the hell out of town and take his ministry elsewhere. The Mayans called Jesus Christ Kukulcan. He soon began preaching his gospel and resuming the teachings he had done when he was in Israel. Mayan oral tradition and codices tell that he arrived by ship and wore a white robe. He claimed to have been born of a virgin and taught baptism. He was associated with a new star and promised he would come a second time. Fifteen hundred years later, Hernan Cortez arrived in Mexico to begin the Spanish Conquest. The Mayan and Aztec people believed Cortez was the second coming of Christ, which made the Conquest much easier for him. My theory is that Central America was actually the lost continent of Atlantis. Even before Christ arrived, A Phoenician ship likely landed on the coast of Central America. The sailors saw the massive pyramids and the wonderful cities of the Mayans, believing they had landed in Atlantis. Upon their return, they reported the wonders of “Atlantis” to the world. Many years later, another group of mariners attempted to make the same voyage. However, being less skillful, they gave up on the Atlantic crossing before landing in Central America. Embarrassed to admit their failure, they reported that the beautiful Continent of Atlantis had simply sunk into the sea, never to be seen again. This article is by Dayton Author and Historian, Dennis Cassinelli, who can be contacted on his blog at denniscassinelli.com. All Dennis’ books sold through this publication will be at a discount plus $3.00 for each shipment for postage and packaging.